When a father loses his son and his wife leaves him, he cannot tear himself away from the small fishing village where the boy's memories reside. Thinking that his life is all but over, he takes to wandering the cliffs, carrying broken things that he always promised his son he would fix, but never did. They're a sign of his failure, and they keep little Toby close. But then he meets the thief of broken toys, and everything begins to change. TIM LEBBON is a New York Times-bestselling writer from South Wales. He's had twenty novels published to date, including The Island, The Map of Moments (with Christopher Golden), Bar None, Fallen, Hellboy: The Fire Wolves, Dusk, and Berserk, as well as scores of novellas and short stories. He has won four British Fantasy Awards, a Bram Stoker Award, and a Scribe Award, and has been a finalist for the International Horror Guild and World Fantasy Awards. 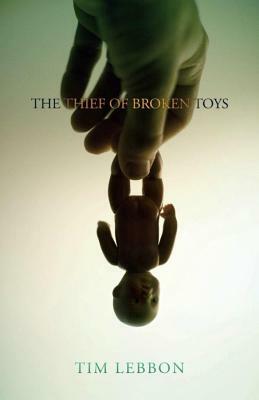 In 2011, his book Thief of Broken Toys (ChiZine Publications) was nominated for the World Fantasy Award in the novella category. He has also been a judge for the World Fantasy Award. In 2004, Fangoria named him "one of the thirteen rising talents who promise to keep us terrified for the next twenty-five years." Only nineteen years left to go . . . better get busy. Forthcoming books include The Secret Journeys of Jack London for HarperCollins (coauthored with Christopher Golden), Echo City for Bantam in the US and Orbit in the UK, Coldbrook for Corsair in the UK, 30 Days of Night: Fear of the Dark for Pocket Books, the massive short story collections Last Exit for the Lost from Cemetery Dance and Ghosts and Bleeding Things from PS Publishing, as well as several other projects not yet announced. He has written several screenplays, and is currently developing two TV series with a British TV company. Several of his novels and novellas are currently in development for screen in the USA and UK, and he is working on new novels and screenplays.Find out more about Tim at his website: www.timlebbon.net.